As a puzzle fan, there are some that I gravitate to over others, those that have the ability to hold my attention very easily. Reflective puzzles are one of my favorites, and if combined with solid presentation, it’s likely I won’t be able to put the game down until I complete it. 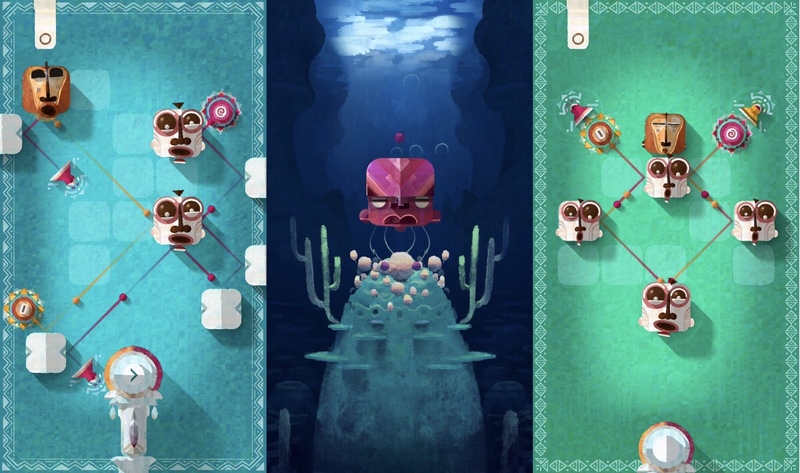 Playmous’ God of Light is one example, a game that combined clever mechanics with gorgeous graphics and a solid soundtrack. I can’t think of any reflecting games since that grabbed my attention in the same way. 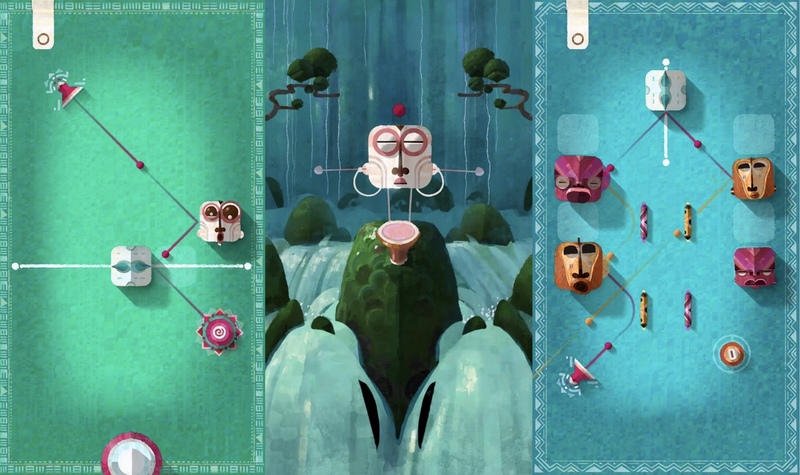 But that changed with this week’s release of ELOH, published by Broken Rules, the folks behind Old Man’s Journey. The game came out of nowhere, sucked me right in, and I pushed everything else aside until I had completed it. Even though it’s not developed by Broken Rules, Lip Comarella is the artist once again and his work, along with SCNTFC’s sound design, makes it hard to resist. 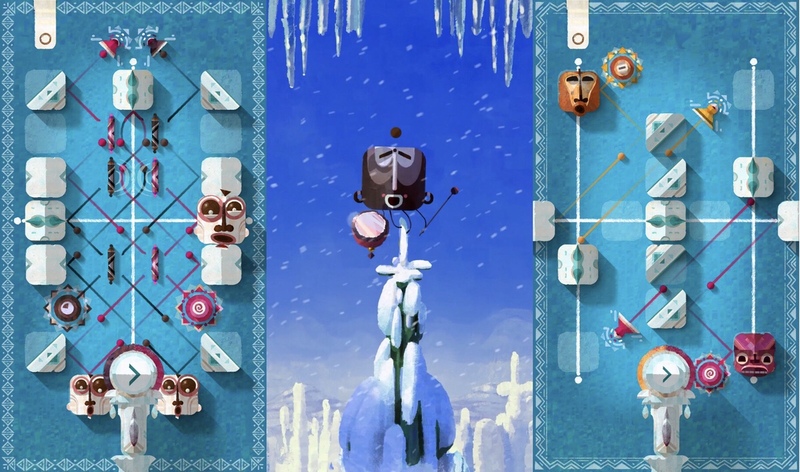 ELOH is advertised as a “chilled out puzzle game” and that’s exactly what you get, but so much more. It’s a reflecting game, but instead of light, you’re bouncing music notes off different blocks to create a tune. It’s not a rhythm game, and the puzzles are still visual, but the soundtrack is a nice bonus. And what’s more, the main blocks you bounce off of are creatures that resemble old African masks. When a note hits one of them, it gets all bug-eyed or makes some other silly face, leaving you with a drum circle-like tune made up of funny faces. The soundtrack, artwork and color palette are both easy on the ears and eyes and unique enough to make it stand out right away. Kudos to the developers for this, as it’s not easy to make something look this charming without being distracting. The pieces are easy to tell apart and manipulate, so I never had to pause to make things out or struggle with the controls. The standout presentation grabbed my attention, but the ease of use is what held it all the way to the end of the game. There are no instructions in ELOH, or any words at all, for that matter. Instead, each new mechanic is introduced through a simple level that allows you to learn how it works without being told. And the beauty of this is that you may not realize all the different ways you can use a certain piece until you’re placed in a specific situation that requires some out-of-the-box thinking. By teaching through play instead instructions, the game allows players to feel smart when they discover new ways to use a seemingly straightforward mechanic. It’s just so satisfying to see all the moving parts come together, even when a puzzle isn’t particularly difficult. While I still consider God of Light to be a fantastic game, it did have some drawbacks like slightly fiddly controls and the fact that it’s in landscape mode instead of portrait. ELOH comes out ahead in this regard, as it’s in portrait mode, making for easy one-handed play anywhere. The controls are also very user-friendly, as you’re not dealing with anything that requires timing or precision. 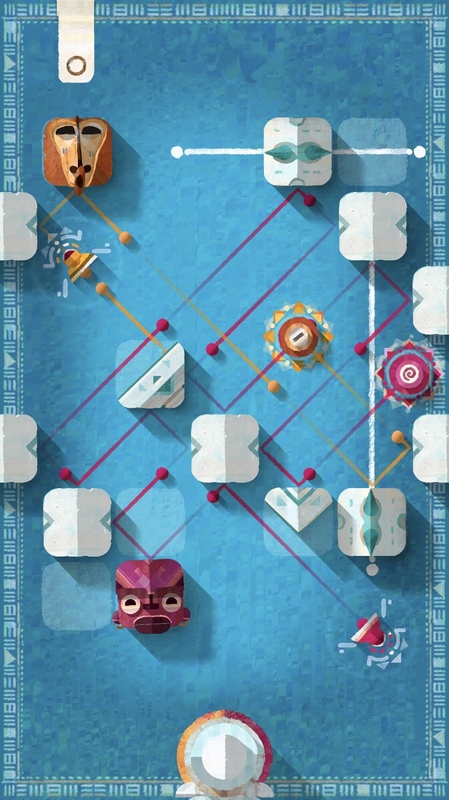 You either drag pieces around to different spots on the board or tap to interact with them. That’s it! 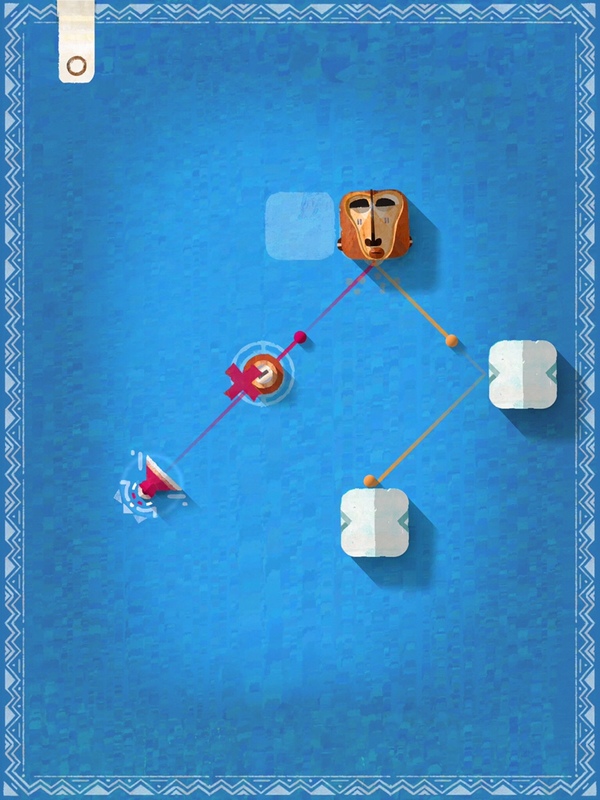 So any challenge comes from the puzzle design, not from battling the controls. It’s basically everything I look for in my puzzle games. Now, I’m aware I haven’t really spoken much about the mechanics themselves, and that’s for good reason. I wanted to try and convince you to play the game without telling you too much, so you can be surprised by everything just like I was. But if you still need convincing, read on, knowing that I may spoil some of the solutions for you. ELOH starts off with just one face, a speaker and a goal piece. The face can be dragged to the one other highlighted area on the board. Then, if you tap the speaker, little balls will start shooting out of it that bounce off anything in their way, creating sounds. 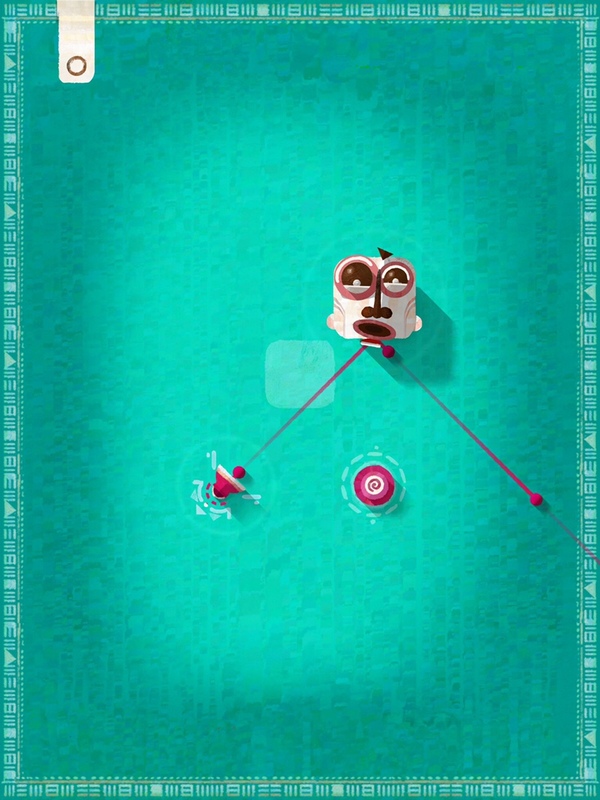 You need to move the face so the pink balls ricochet off it and to the pink circle piece, which is the goal. Soon, more faces are added, as well as blocks that are stuck in place and can’t be moved. But things really start to get interesting when the orange objects are added. An orange goal piece requires orange balls. Those can either come from an orange speaker or be turned orange by bouncing off an orange face. More colors are added later, and sometimes you have to reflect balls from two or three speakers to different goals. Where things get especially interesting is when colored bars are added. The way these work is, if the color matches the ball, the ball goes through it. If not, it bounces off. This mechanic opens up the game to a whole bunch of new possibilities. You then need to decide whether the ball should be going through a bar or bouncing off of it, and at what point should a ball be changing colors, if at all? There are also blocks that slide along tracks, reminiscent of Puzzlepops! These mechanics make for some truly clever solutions, even though the core idea of the game has been done before and some of the mechanics have been seen before as well. As a full package, it feels fresh and unique. And the mechanics are introduced at the perfect pace so they never overwhelm, and only temporarily confuse as you learn how to use them. ELOH is one of those rare games that shines in just about every aspect. I love the look and feel of it, the sound of it, and the cleverness of it. I also appreciate that it’s so chill and laid-back, that you never get penalized for messing up. You just go at your own pace and take as much time as you need to solve a puzzle. I’m even impressed with the way the balls often make an intricate pattern as they bounce off all the different blocks. It’s a treat for all the senses, all while giving your brain a gentle massage. If you’re a puzzle fan, this is a must-have game, even if it’s not the longest. I always prefer quality over quantity, and ELOH is of the utmost quality. So don’t even hesitate — just grab the game here and give those blocks a few good knocks. And if you’re stuck, you can try my walkthrough guide. Giveaway: Win a Baby Monkey Promo Code!